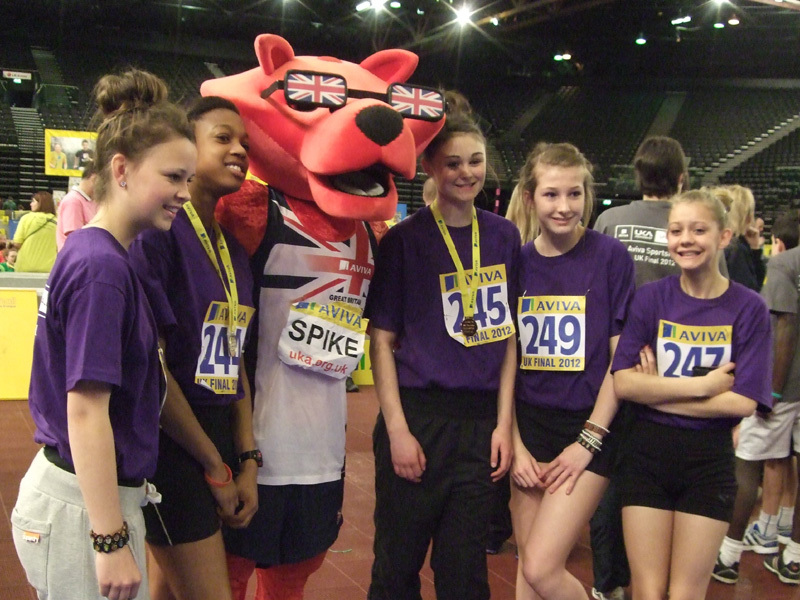 National Sportshall Final LG Arena Birmingham Kent’s U/15 girl’s finish 3rd. For the second year in a row Diana Adegoke became Sportshall National Champion in the Standing Long Jump, this time in the U/15 age group. Diana jumped 2.55m with the second placed athlete from Humberside 2.54m and Rhiannon Wallwork claiming the Bronze medal with 2.52m.Rhiannon just missed out on another medal in the 4 lap race finishing = 4th in 49.3s. Kent claimed 2 more medals in the Vertical Jump with Joanne Okusanya =3 with 63cm and Renique Joseph winning Silver with 65cm. Renique went on to win a Bronze medal in the Shot 10.32m. Charlotte Tappenden‘s best event was the Speed Bounce where she finished a creditable 12th with 80 bounces. Pippi Randall took over Ella Waldron’s place in the team as Ella was unable to come because of a school trip. She competed in the 2 lap race Speed Bounce and Vertical Jump. Ciara Ewart joined Renique, Charlotte and Joanne in the 4x2 relay where they finished 3rd in their heat to qualify for the final 1m33.8s. In the final they finished 5th 1m34.3s. 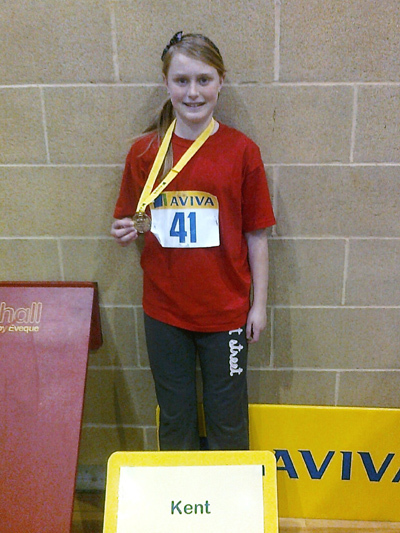 Rhiannon Wallwork claimed another medal in the all-rounder competition finishing 3rd. Joanne who tied 1st place with Rhiannon in the Regional Final came 4th just 3 points behind and Renique Joseph 8th this was out of 87 competitors from all round the UK. 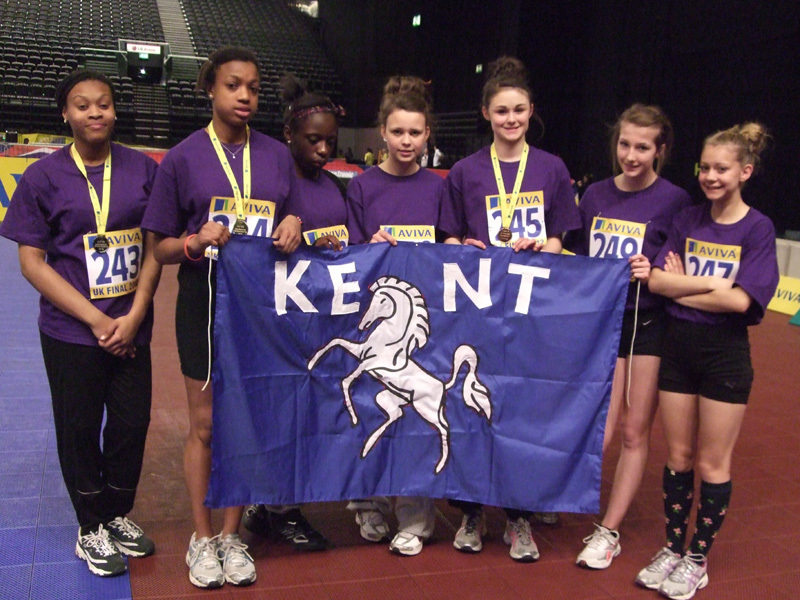 The Kent team came 3rd overall a fantastic achievement with all but one of the girls in their first year as U/15s. A big thank you to all the support by the parents who made the 300 mile trip to Birmingham and back. It was another 1st for Kent at Burgess Hill on Sunday when the Kent U/15 girls’ team qualified for the National Final in Birmingham. Competing against some very strong opposition the team won by 20 points from Surrey with Berkshire 3rd. 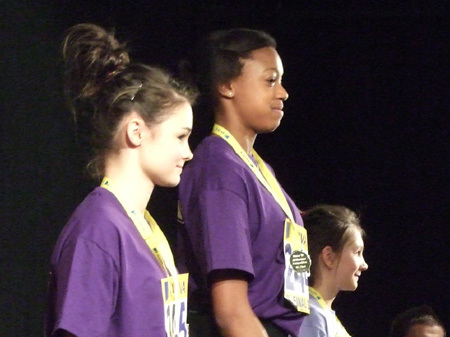 Rhiannon Wallwork (Invicta EK) and Joanne Okusanya (Bexley) came joint first in the All-rounders competition and qualified for the National Finals in their own right, they were just 2 points ahead of the 3rd placed athlete from Oxfordshire, so a close competition. Renique Joseph (Bexley) won 2 gold medals one in the Shot 9.82m and another in the Vertical Jump 70cm. Diana Adegoke (Thanet) won the Standing Long Jump 2.54m, whilst Rhiannon came 2nd in the same event just 2cm under Diana’s score with 2.52 m. Rhiannon also claimed a Bronze medal in the 4 lap race finishing 3rd in 53.4s. 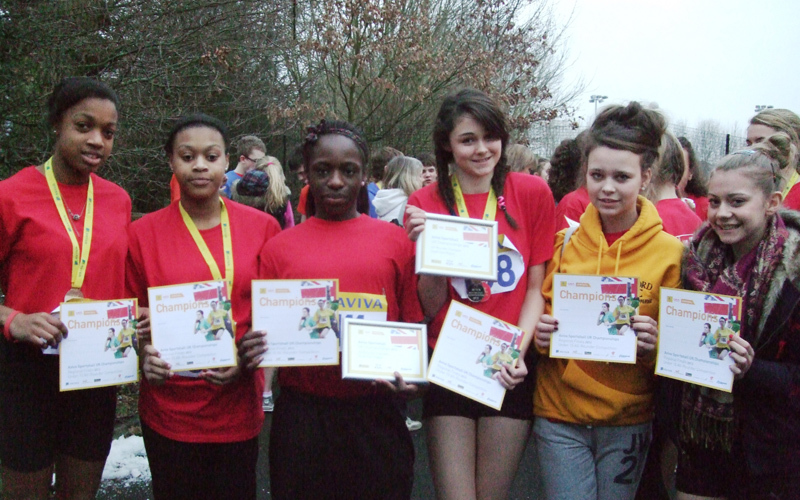 Joanna won Bronze in the vertical Jump with 66cm and was 4th in the 2lap race 25.3s. Charlotte Tappenden (Ashford) despite an excellent Speed Bounce of 81 could only manage 9th place in the event. 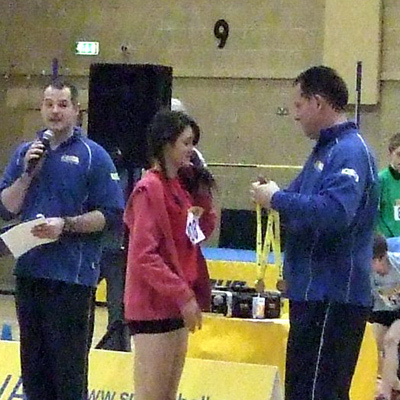 Ella Waldron’s (Dartford) best event was her Vertical Jump 57cm which she came 8th out of 21 participants. The final event of the day was the 8 lap Paarlauf. Pippi Randall (Invicta EK) ran with Rhiannon, this turned out to be a crucial race, the girls ran a tactical race alternating between running 1 and 2 laps each, finishing a close 2nd. There were 70 points up for grabs for 1st place, 60 for 2nd place and so on, so if they are had come lower than 4th the team would not have won. The U15 boys suffered as Jake Perry broke his arm the day before and could not compete so Jordan Hudson from Newington took his place. Ben Isaac (Ashford) who was the U/13 National Triple Jump Champion last year moved up to the U/15 age group and coped well, coming 3rd in his Triple Jump with 8.01m. Ben was 5th in the Speed Bounce with 75 bounce. Ben joined Joseph Holland (Paddock Wood) in the 8 lap Paarlauf, Joseph just missed out on a medal in the Speed Bounce coming 4th with 77. Mason Doyle (Paddock Wood) jumped into 5th place with his Triple Jump 7.78m and = 6th in his 2 lap race (23.7s). 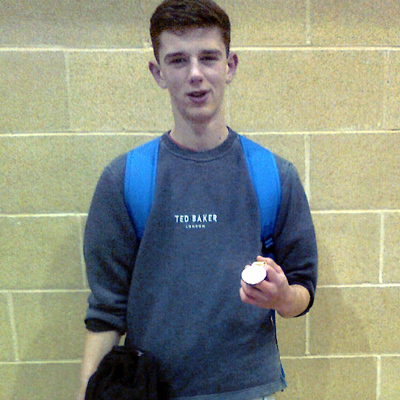 Gareth Funnel’s (Newington) best result was the Standing Triple Jump, 6.07m. 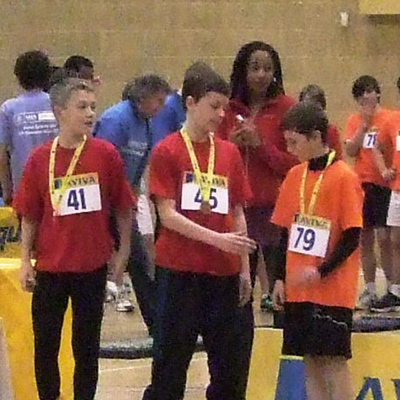 James Young (Newington) was the 6th member of the team covering the 4 lap race, the Shot and the Standing Long Jump, 2.14m. The U/15 boys team finished 6th. The U/13 girls won 4 medals. Jaimee-Ann Hayes (Ashford) led the way with a good win in the Speed Bounce, 86 bounces, Chantelle Bailey (Thanet) came 2nd in the Standing Long Jump 2.25m, Magda Cenciala (Bees Academy) won Bronze in the Standing Triple Jump, 6.55m and Alice Fox (Thanet) had a great run in the 2 lap race qualifying for the final finishing 3rd (26.2s) to claim a bronze medal. Catrin Murphy (Bees Academy) just missed out on a medal in her 4 lap race fishing 4th in 55.8s. Maddy Johnson (Thanet) along with Hannah Owen (Ashford) covered the High Jump, Maddy came =5th 1.35m and Hannah jumped 1.25m.Tanya Bailey (Thanet) joined Hannah in the Shot putt. Natasha Scott (Medway & Maidstone) also just finished outside the medals in the Standing Triple Jump. Emilia Isaac (Ashford), Alexander Prickett (Ashford), Jaimee and Hannah came an excellent 2nd in the Obstacle relay and Alice, Magda, Chantelle and Eleanor Potter(Ashford) finished 2nd in the 4x2 lap relay. The team finished 5th overall. 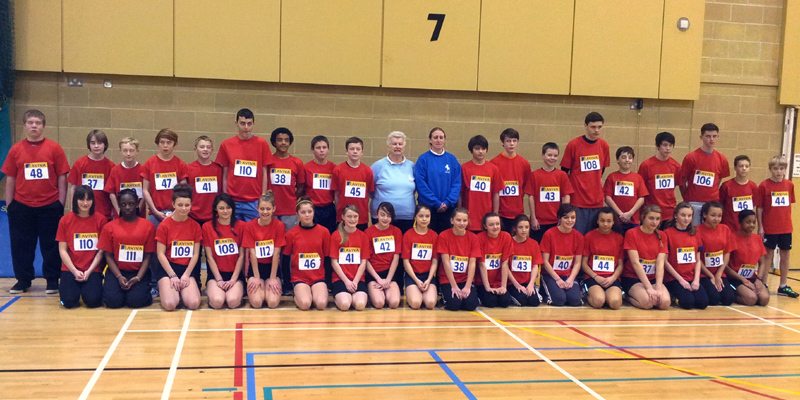 In the U/13 boys Adam Jaques (Thanet) easily won the Shot Putt with 10.23m. Cameron Amedee took Gold in the Standing triple Jump with 7.42m and he came 5th in the 4Lap race (54.7s). Joel Lill (Folkestone) was 5th in the 6 lap race (86.9s) a tremendous result as his opponents were twice his size! Matthew Brisley (Folkestone) and Oliver Marsh (Ashford) shared 3rd place in the Speed Bounce each getting 79 bounces. Jake Timmins (Ashford) and Kian Crawford (Ashford) did the High Jump 1.25m and 1.15m respectively. Giles Manning (Ashford) jumped 2.06m in the Standing Long Jump partnered by Leon King 2.11m. Sam Dawson-Dale helped to fill in for an absent athlete covering the Vertical Jump as did Joseph Whitby in the Standing triple Jump. Edward Miller did the Shot Putt and the 4x1 relay. Oliver, Kian, Joseph and Cameron were placed 2nd in the Obstacle relay race. The U/13 boys team finished 6th. Our celebrations were cut short when we had to evacuate the hall so my usual photos of medal winners were not taken. The winning U/15 girls’ team was taken outside while we waited for permission to go back inside. Thank you to all parents who sent me some of their photos. It is also a big thank you to parents and coaches who braved the snowy weather they encountered on their journey to Burgess Hill to get the whole team there. Our last thank you is to all those who helped on the day. 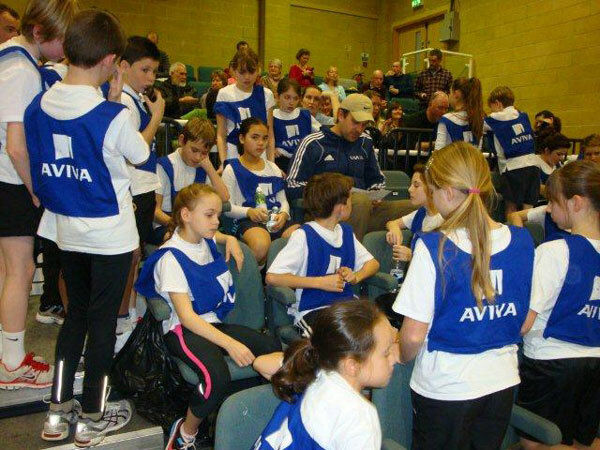 28 Under 11 athletes from all four corners of the county travelled to Burgess Hill in West Sussex on Sunday to represent Kent at the Aviva South East Regional Under 11 Sportshall Athletics Festival. The 28 were wonderful ambassadors for Kent and solid displays saw the girls and boys teams finish fourth in their respective competitions. There were some fine individual performances, particularly in the field events, but some inconsistencies in the track events probably cost both teams a top three place. 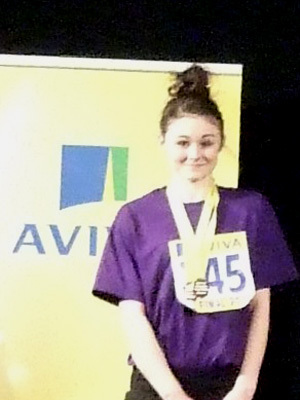 For the girls, Amy Goodfellow (Thanet AC) won the Vertical Jump with a new personal best of 56cm and finished second in the Chest Push with 7.50m. Omega Skeen (Thanet AC) matched her club-mate by winning the Chest Push with 7.75m and taking second in the Standing Triple Jump with 6.05m. Omega’s triple jump was beaten only by Karina Harris (Bees Academy) who matched her personal best of 6.25m for an outstanding victory. Hannah Graham (F&S Runners) won the Speed Bounce with 58 and Imogen Allen (Bexley AC) was equal first in the Balance Test with a maximum 60 score. 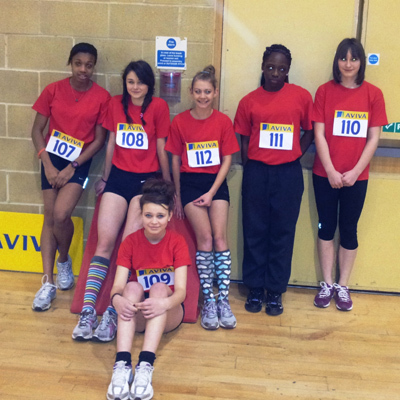 The girls’ best performances on the track came from Faith Cox (Ashford AC) and Omega Skeen who were second in the 6 Lap Paarlauf; and Isabella McSweeney (St Mary’s Catholic Primary School, Whitstable), Hannah Graham, Rebecca Humphries (F&S Runners) and Ria Downes (Thanet AC) who were second in the Under/Over Relay. Alfie Stemp (Paddock Wood AC) was the outstanding athlete for the boys, winning the Vertical Jump with a new personal best of 53cm and second in the Javelin with 19.0m. Jack Norman (Minterne Junior School, Sittingbourne) won the Chest Push with 7.25m; Jason Orusanya (Bexley AC) won the Standing Long Jump with 2.10m; Gabriel Roberts (Woodlands Junior School, Tonbridge) was equal first in the Balance Test, also with a maximum 60 score; and Max Candeland (St Mary’s Catholic Primary School, Whitstable) and Thomas Keaveney (Ashford AC) shared first place in the Speed Bounce with 52. Best performances on the track were Gabriel Roberts, Harry Lutz (Thanet AC), Max Narracott (St Mary’s Catholic Primary School, Whitstable) and Alfie Stemp, who were third in the Hurdles Relay; and Jack Norman, Alfie Stemp, Max Candeland and Thomas Lunn (both St Mary’s Catholic Primary School, Whitstable), who were third in the Over/Under Relay. 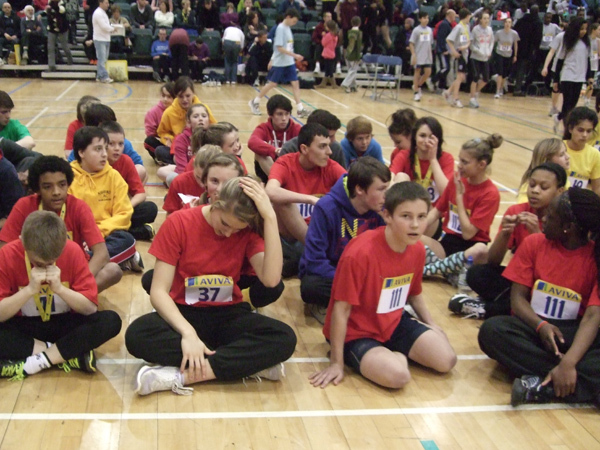 Darren Hatton, former Great Britain decathlete, Thanet AC coach and team manager for the Kent Under 11 squad, said “The athletes were a credit to themselves, their parents, their clubs and schools and to the county. They performed very well and had a great day. They bonded well as a team and that helped the performance. I would like to thank James Bridge and the other coaches, the parents for supporting the athletes through the trials and on the day itself, and most of all every single one of the 28 athletes”. Girls – 1st Jersey 442 points; 2nd Berkshire 424; 3rd Hampshire 414; 4th Kent 403; 5th Sussex 387; 6th Buckinghamshire 372; 7th Surrey 347; 8th Oxfordshire 339. Boys – 1st Berkshire 419; 2nd Hampshire 414; 3rd Surrey 412; 4th Kent 388; 5th Sussex 387; 6th Buckinghamshire 384; 7th Oxfordshire 367; 8th Jersey 357.